Nope, I was just resistant to some parts of the training. For instance, even though I used to make a straight commission, I had a hard time selling something if it wasn't something I'd be willing to spend my own money on. So 'inexpensive' cheap junk didn't go to far in my sales (because, hey, do YOU want to be blamed by your customers for it after the sale?). Anyway, you've had a few years to get to know me. Do you really think I ever don't speak my mind? Well, here we are! $ 2300 for mainboard + POWER9 CPU + cooler certainly is not bad! Prices seem more realistic this time around. > Prices seem more realistic this time around. I find 2300 USD for the mainboard plus CPU (and heatsink and I/O plate) quite a bargain. After adding off-the-shelf RAM, graphics card, sound card, storage controller card, storage drive and case with PSU it should still be possible to arrive at below 3000 USD for a complete POWER9 system. much more "Bang for the Buck", than the X1000, or X5000 systems. Now that work has begun on the MorphOS porting to x64, I wonder if any of the MorphOS Dev. 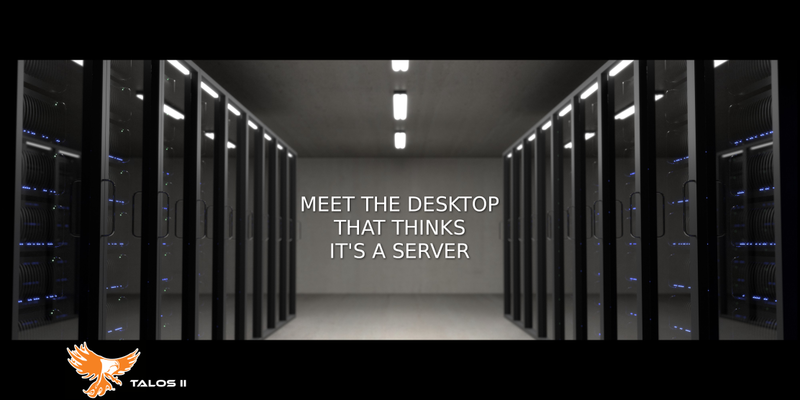 Team members would even consider supporting the TALOS Workstation, if they were given one of them for free by community members? I have not paid any attention to just how powerful the Power9 PPC CPU used in this workstation really is, when compared to the low cost x64 alternatives, but I can imagine that if it is even close to being comparable, then Jim must be salivating something terrible, wanting to have some great OS to run on it. Even if it wasn't MorphOS, I suppose he would be happy to run Linux instead, now that he has been using it more often. I'm also guessing that running MorphOS that can only utilize one CPU core, on such a powerful system, would be a terrible waste, and we all know that we will most likely never see any form of SMP, or even ASMP for the PPC version of MorphOS. Still, very interesting to see anyone outside the Amiga and MorphOS community still show an interest in a desktop PPC system. Edit: If this workstation can be considered a "desktop" computer? much more "Bang for the Buck", than the X1000, or X5000 systems. Yes, unlike overpriced Aeonkit HW, this is aftually kind of interesting and worth its price. But for MorphOS...? Now that work has begun on the MorphOS porting to x64, I wonder if any of the MorphOS Dev. Team members would even consider supporting the TALOS Workstation, if they were given one of them for free by community members? Why should paying customers provide them with free hardware? The team have money. They can buy any HW they are interested in. And they do, they bought the X5000's, the Sam, and all other machines they have supported. I have not paid any attention to just how powerful the Power9 PPC CPU used in this workstation really is, when compared to the low cost x64 alternatives, but I can imagine that if it is even close to being comparable, then Jim must be salivating something terrible, wanting to have some great OS to run on it. It's very powerful, but mostly in ways that aren't really relevant in a traditional Amigoid context I think. Considerable focus is put on massive bandwidth and parallellism. I can't really see where this makes sense or is harvestable for MorphOS. I don't know. They have said that the Sam port meant nothing for platform growth of MorphOS, but meant a lot for cleaning and evolving the MorphOS source code. They have also said similar things about the X5000, i.e. not really about market/platform growth, they don't expect that to happen, that's not why they did it. Maybe a port to this system would mean possible cleanup and evolution of the general source code in some ways, that would be generally beneficial for MorphOS? Or just a cool journey of exploration for the developers? But for users, a tight, highly integrated ARM CPU in a more traditional (low cost, cool and silent) computer context would be much more interesting IMHO. Theoretically, if "MorphOS NG" is made hardware agnostic, including the SDK with a build system similar to Linux distributions, then there is no reason to why not more than one platform/architecture could be supported, including PPC and POWER. IMHO it's something else. Even if it could be used as one, its features and design clearly has other areas of use in mind. > the X5000's, the Sam, and all other machines they have supported. And Jim makes no secret of his numerous graphics card donations to Bigfoot. > parallellism. I can't really see where this makes sense or is harvestable for MorphOS. > market/platform growth, they don't expect that to happen, that's not why they did it. "it had some sideeffects everyone using MorphOS right now benefits from. Huge parts of the boot process and the kernel needed to be rewritten/cleaned. Tons of bugs sitting there were found and fixed. Stuff optimised. Less memory used. So the other systems are now even more stable, have a little more free memory for applications and boot faster. [...] It also (main reason for supporting the 460) allowed to support X5000 boards (getting it to boot) in hours instead weeks." According to this, "cleaning and evolving the MorphOS source code" allegedly was just a welcome side effect. The "main reason for supporting the 460" allegedly was faster support of the X5000, a platform they now say there is no real market for (which is the same thing they said about the Sam460 before). Supporting a platform with no market to faster support another platform with no market? Weird, huh? >> If this workstation can be considered a "desktop" computer? > features and design clearly has other areas of use in mind. > is the processor quoted really a four core? "Currently on its way to my doorstep is a two-CPU, octocore (each core is SMT-4, so that's 32 threads) Sforza POWER9 Talos II "
"if you were actually in the market for an AmigaOne X5000, this blows it out of the water. You could just run UAE on this and have cycles to spare!" I guess this means that OS4 runs allegedly faster in (FS-)UAE on Talos II (is there even PPC emulation in UAE for anything other than x86(-64)?) than natively on the X5000. Well, Mark might accept one, but that wouldn't guarantee a port. Frankly, it would make more sense to buy him a Ryzen 1800X cpu, an AM4 motherboard and some DDR4. That way his compile times on the software he is working on would be faster. And what I'm sending is rather modest, as my expenses paying for classes out of pocket rather taxes my income. Anytime any of you feels like chipping in...(David has offered, but David's finances are probably tighter than mine). BTW - I'd rather buy one of these than an X5000 myself. It's only a few hundred more, and so much more capable. I got a FX-8370 + MoBo + 16 GiB DDR3 to offer when I switch to a Ryzen-based gaming PC the next two weeks. Not quite the same league as a Ryzen, but for building jobs on Linux more than adequate. If some Dev is in need. Mark's current system is FM2 based. Not quite as powerful as the AM3+ based system you have, but I think he wants to move straight to an 1800x. He wants a significant reduction in compile times. No problem. I would only charge the postage if some other Dev has use for it. If any of the developers want to take advantage of this offer, I'll pay the postage. I can highly recommend the FX8370, as I've used the very similar FX8350. > I'd rather buy one of these than an X5000 myself. > It's only a few hundred more, and so much more capable. - With the 3U HSF assemblies, noise is very low. - To provide maximal PCIe bandwidth for all peripherals, each slot is serviced by a dedicated CPU. As such, two CPUs are required to activate all PCIe slots"
The OCuLink sounds interesting. But the last point is not quite clear to me. The Talos II board has 3 PCIe x16 and 2 PCIe x8 slots. Which of these slots can be used with the single-CPU configuration? Good question. Why not relay it to Raptor? Btw - The issue of EPS power connection is not such a big deal. I ran a dual Xeon system with a similar power connector using a standard 650 watt Thermaltake psu with an adapter for the second 12v connection. That type of thing does NOT require a specialized psu. The board form factor is more of a PITA, but I still have the case I bought for the Xeon system. >> can be used with the single-CPU configuration? > Good question. Why not relay it to Raptor? Odd, only one PCI-E X16 and X8 slot? If it has three, and they are split between the processors, which one controls the third X16 slot? I'm curious myself. I expect there to be a follow-up message on the Debian PPC mailing list soon. > is there even PPC emulation in UAE for anything other than x86(-64)? > Totally confusing CrowdSupply post by Raptor Engineering. I found nothing confusing about the post. > Price now $3700 with cpu and some accessories? Talos or TalosII? Power8? Power9? The right column isn't part of the post. Everything in that column is a remnant of the Talos I and to be ignored for Talos II. > Now available? Shipping in November if ordered now? Now available for pre-order ;-) "Pre-orders placed by the middle of September will ship this year." While the reminants of the old listings may have made sense to you, their presence there just confused me.